Hello readers, It’s that time again for Tuesday’s Top Five Favorite Junk Finds! October is here so lets start off the month with some Halloween Junk Inspiration . 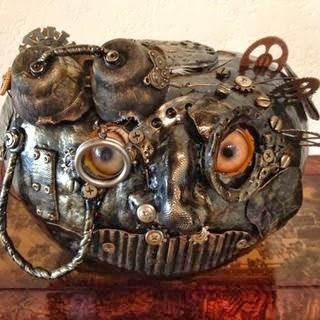 In my opinion Steampunk artists do junk art to the extreme. They really know how to incorporate vintage junk into gorgeous art. 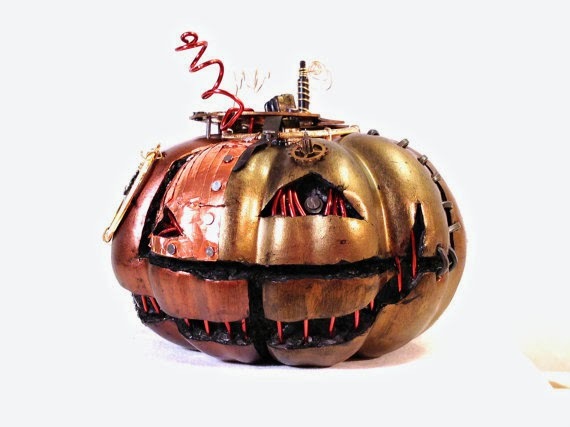 Now I am sure you have seen the adorable junk encrusted pumpkin art out there, but have you seen the Steam punk style ones? Well take a gander at these scary beauties! 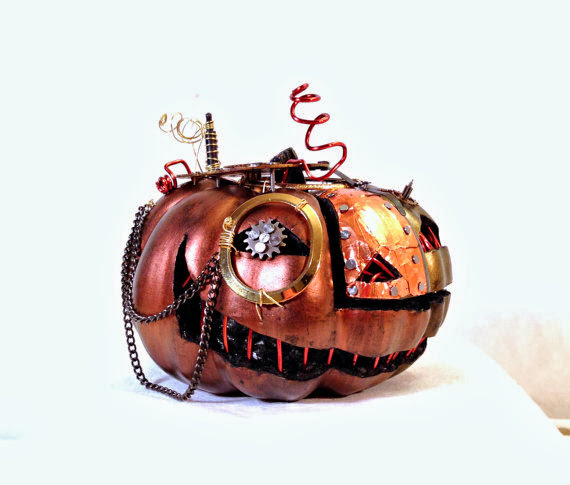 For the first feature we have “Jack Catterwall ” by Anne E. Weaver this is her version of a steam pumpkin that she created this month for a Michael’s pumpkin challenge, carved with a heat knife this guy was created with materials you can find their store. Pretty awesome, love the mouth detail. 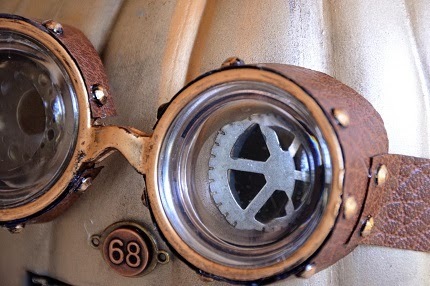 Check out the crafted goggles, aren’t they cool as all heck? I love the nose too! 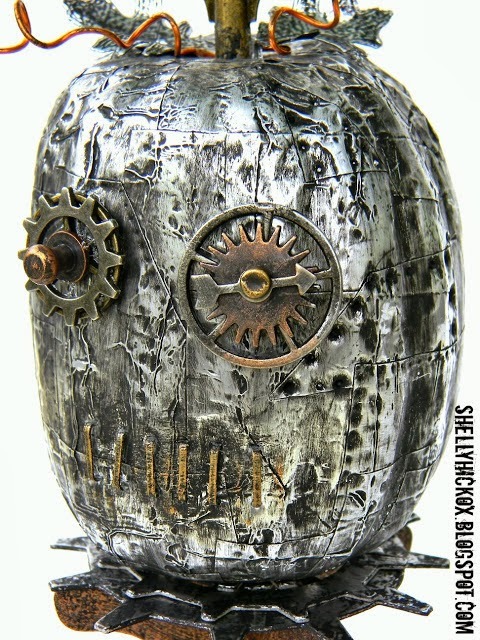 This ” Steampunk’n ” was created by Shelly Hickox last year for the Compendium Of Curiosities Challenge using Tim Holtz’s riveted patchwork technique. This compelling piece was created using Ideology bits and pieces, and a cupcake stand. I love the texture on this one! Here is the full view, gears, staples, wire, clock key, oh my! Next in the show lineup is by Etsy artist Melanie McCullough hailing from Alabama, she has a great shop over on Etsy offering wonderful pumpkin art such as these. I love them all, it was extremely hard to choose just one! Be sure to head on over there and check them all out, I adore the copper and brass theme she did on this one! here is the other side view, she has a number of these in different styles currently available for very reasonable fees if you want to see more of her work, tell her I sent you! This one is by artist Yami Guru, I love the incorporated purple lights! Great work here! He has posted a tutorial on how he created this if you feel a hankering to craft your own. 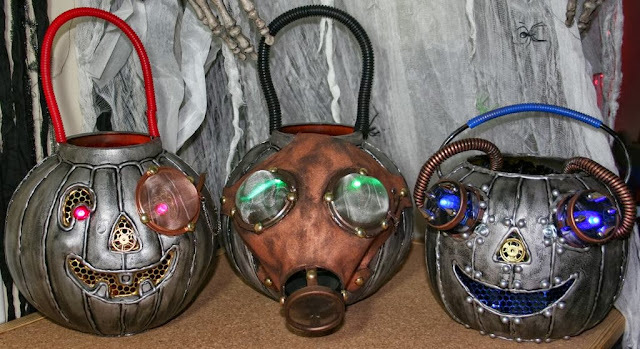 Here are some more examples of his work, look at the gas mask one, genius! 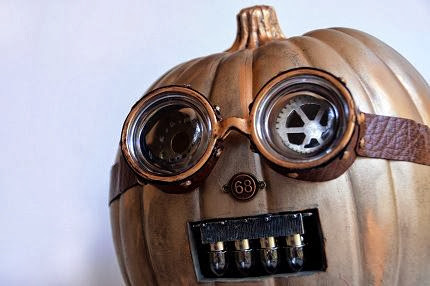 The fifth feature of the week belongs to Windsbro check out his awesome rendition of a ” Steampunkin ” he used a real pumpkin here with sculpy and lion taxidermy eyes – gives it that extra creepy factor doesn’t it? 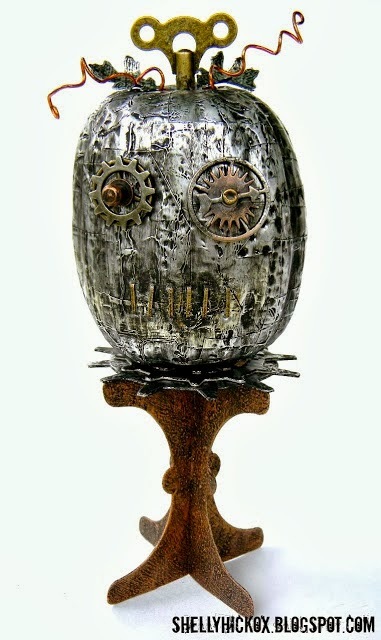 He also has a tutorial on how he made this scary guy, check it out! 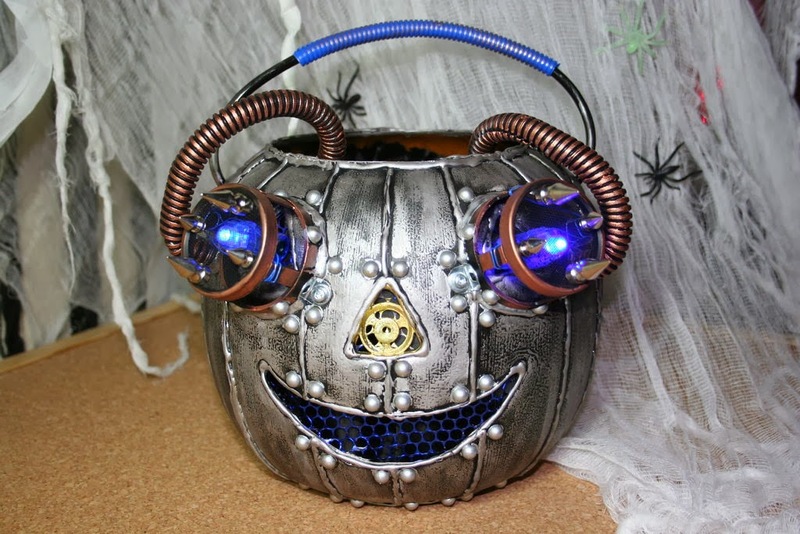 I hope this weeks great features inspired you to create your own rendition of junk pumpkin art! Please be sure to visit the artists links and share the love!